Definition at line 16 of file MmappedFile.h. Definition at line 56 of file MmappedFile.cc. References assert, debugs, HERE(), path_, and xstrdup. Definition at line 64 of file MmappedFile.cc. Definition at line 127 of file MmappedFile.cc. Definition at line 133 of file MmappedFile.cc. Definition at line 118 of file MmappedFile.cc. References assert, IORequestor::closeCompleted(), debugs, doClose(), HERE(), ioRequestor, and NULL. Definition at line 102 of file MmappedFile.cc. Definition at line 108 of file MmappedFile.cc. References fd, file_close(), and store_open_disk_fd. Referenced by close(), write(), and ~MmappedFile(). Definition at line 139 of file MmappedFile.cc. Definition at line 29 of file MmappedFile.h. Definition at line 215 of file MmappedFile.cc. Definition at line 72 of file MmappedFile.cc. References assert, callback, debugs, error_, fd, file_open(), IORequestor::ioCompletedNotification(), ioRequestor, maxOffset, path_, store_open_disk_fd, and xstrerr(). Definition at line 145 of file MmappedFile.cc. 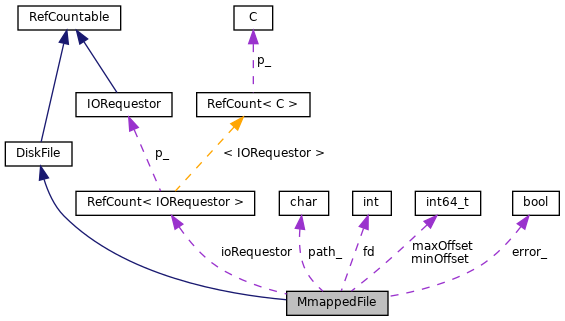 References assert, buf, ReadRequest::buf, debugs, DISK_ERROR, DISK_OK, error_, fd, HERE(), ioRequestor, ReadRequest::len, Mmapping::map(), MAP_NORESERVE, maxOffset, minOffset, NULL, ReadRequest::offset, IORequestor::readCompleted(), and Mmapping::unmap(). Definition at line 175 of file MmappedFile.cc. References assert, WriteRequest::buf, DBG_IMPORTANT, debugs, DISK_ERROR, DISK_OK, doClose(), error_, fd, WriteRequest::free_func, HERE(), ioRequestor, WriteRequest::len, maxOffset, minOffset, NULL, WriteRequest::offset, IORequestor::writeCompleted(), and xstrerr(). Definition at line 46 of file MmappedFile.h. Referenced by error(), open(), read(), and write(). Definition at line 40 of file MmappedFile.h. Referenced by canRead(), canWrite(), doClose(), getFD(), open(), read(), and write(). Definition at line 37 of file MmappedFile.h. Referenced by close(), open(), read(), and write(). Definition at line 44 of file MmappedFile.h. Referenced by open(), read(), and write(). Definition at line 43 of file MmappedFile.h. Definition at line 36 of file MmappedFile.h. Referenced by MmappedFile(), open(), and ~MmappedFile().